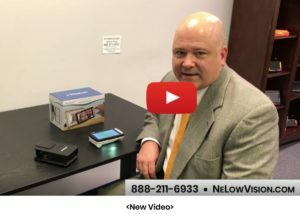 For Doctor Pricing, please e-mail us at info@nelowvision.com. The UltraMag 5 is a handheld electronic video magnifier that you can take anywhere. UltraMag 5 features a uniquely-designed folding handle and includes near-viewing, far-viewing and table reading modes. Small enough to fit in your pocket or purse, the UltraMag 5 is the ideal companion to provide magnification, on the go. With the UltraMag 5, you can easily read bank statements, coupons, prescriptions, restaurant menus, sign checks – anywhere you need portable magnification. The UltraMag 5 provides hours of low vision enhancement. 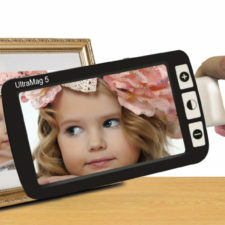 Featuring a built-in, LCD screen (5”), the UltraMag 5 allows you to magnify images up to 30 times. A built-in Freeze-Frame feature allows you to capture any still image. Nine different viewing modes allow you to choose alternate color combinations based on your personal preference.